What's next in your lifelong journey? for realizing extraordinary capacity to thrive in your life-work-&-relationships. What’s next in your lifelong Learning Journey? These potent times in our lives and world stretch and inspire us to expand the scope of our capacity for learning, wisdom, mindfulness and heart-fullness, in order to skillfully respond to the enormous challenges and embrace the profoundly inspiring opportunities we are being offered. Are you searching for relevant and meaningful transformational learning experiences that encompasses a holistic-integral view of life and are grounded in discerning science, deep wisdom lineage, and real world applications? Are you seeking mentors with high integrity, deep experience in personal AND social/organization/community transformation – who are also accessible enough for you to develop a personal, meaningful, and on-going relationship with? Have you realized that personal transformation without social transformation – and social transformation without personal transformation — simply makes no sense in today’s world? Would you be nourished by the intimate inspirational camaraderie of kindred colleagues who are dedicated to exploration, experimentation, and deep practice within a thriving learning community? are worthy of your attention & participation. As the circumstances of our lives, world, society, economy, and environment become ever more disrupted in these “VUCA” times of increasing Volatility, Uncertainty, Complexity, and Ambiguity, it is becoming increasingly clear that to thrive – in what is also being called “The Time of the Great Unraveling” and “The Time of the Great Turning” – that “business as usual” will not be sufficient for any of us, our organizations, or communities. As Einstein reminds us, the solutions to the complex challenges in our lives and world will not be found at the same levels of thinking or consciousness that created them! A substantially new level of consciousness is needed if humanity is to survive – and thrive – and the means to personally and collectively realize these new levels of consciousness are available for anyone sufficiently motivated to learn and practice them. It’s time for a revolutionary approach to developing ourselves for the Journey to come and this Learning Expedition is about realizing our “extra-ordinary” potentials! We envision this Learning Expedition experience as an intimate, in-depth, on-going, reflective, embodied, and practice-oriented learning community made up of a diverse, caring, kindred souls coming together to form a mutually nourishing community of practice dedicated to bringing benefit to the fields of influence, communities, movements, and organisations that we serve. Given the rich mix of complex forces, challenges, and opportunities at play in our lives and world at this time, this learning expedition will be inspired by the principles and practices of creative altruism associated with a fierce dedication to awaken to our True Nature and Highest Potentials in order to inspire, activate, and awaken these latent potentials within all beings. The deep science and universal principles and practices at the heart of this curriculum provides inspiration and clear guidance for how to deepen our wisdom and move beyond the barriers of our isolating self-concern, by expanding our frame of reference to care for the welfare of all beings. Our vision is that the benefit, inspiration, and blessing that each of us receives on this Learning Expedition will ripple out into our world in beneficial ways that far exceed our imagination. We will gather together for 5 sessions over the course of a year to fifteen months. 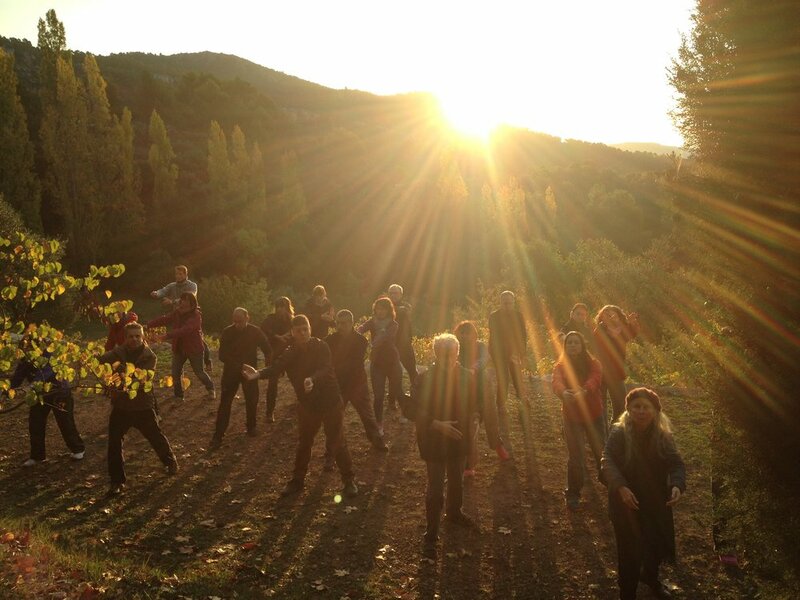 Each session-retreat will span 4 days and will include times of teaching and co-learning…deep reflection…silence…heartfelt sharing…and time in beautiful natural surroundings. European sessions will be held at a variety of venues throughout Europe and the UK depending on the season and availability of suitable venues in beautiful natural surroundings. North American Sessions will be based mostly at the Leveys’ lovely home and learning center in Seattle with perhaps 2 or 3 sessions in other locations. Please let us know of your interest as soon as possible. Launch dates will be announced when we have a “critical mass” of people signed up for these sessions - hopefully Spring of 2019. – Access to a Slack-site-based treasure trove of mind-stretching and heart-opening curriculum of deep reflective questions and inspiring media that will inform, inspire, and expand the scope and dimensions of our explorations together. who are curious, self-motivated learners and leaders seeking to deepen in their personal and professional development. with the courage to open their hearts and minds to the complex and often overwhelming circumstances of our lives and world. who are enthusiastic about engaging wholeheartedly in our learning community and curriculum. who have awakened and suffered sufficiently to sincerely value kindness, compassion, and dedication to a higher purpose for their lives and work. with the maturity to appreciate and respect teachers, colleagues, and the natural world…. who yearn to understand the complex forces at play in our world and to respond to them more creatively, courageously, and compassionately. The learning experiences and treasury of inspiring resources for this learning expedition is distilled from a myriad of ancient and contemporary sources and wisdom traditions, reflecting our best curated sense of the most relevant inspirations, accessible resources, skillfull methods, and illuminating perspectives available to inspire our lives and work in these threshold times. Like all expeditions, this one begins with a clear and thoughtful plan and clear sense of direction. As we share this Journey and begin to discover the wisdom, gifts, interests, and strengths of our fellow-explorers, we anticipate that this learning expedition will also be shaped through our collective interests and engagement, and that it will morph, adapt, and emerge in its unique form and spirit of adventure. On our own life-journey we have been fortunate to have studied deeply and widely with beloved and esteemed mentors from many different modern and ancient wisdom traditions, and we’ll offer our best blend and integration of these enlightening, liberating, life-affirming traditions that have such extreme relevance, profound practicality, and deep meaning for our lives, work, leadership, learning, and activism in these profound complex times. We are offering this Learning Expedition on a sliding scale and encourage you to be as generous as possible in order to enable us to offer some scholarships to qualified participants who, though they have less financial resources, will bring a bright spark to our collective wisdom and learning community, and to the communities they serve through their involvement in this transformational journey. We are delighted to offer some scholarships for these sessions. Please contact us for an application. For any sessions held at locations other than the Leveys’ home in Seattle, additional fees will apply to cover personal expenses for food and lodging at moderately priced venues hosting our sessions. In order to encourage the participation of young leaders, we encourage each participant to consider sponsoring/supporting the participation of a young leader in your community or organisation. If you are interested in funding a specific person for a scholarship, please let us know the details. If you are interested in a scholarship, please contact us for a Scholarship Application. 2) To confirm your participation please send us your full payment – or your deposit of €500/$500. You can make your offering in person if you’ll see us soon, or send your deposit via check, credit card, or PayPal. Full Payment is requested 45 days before the first session. Deposits and payments are non-refundable after that time.